So I picked up these naan bread from Wegmans, which are slightly larger than the traditional flat, oven-fired bread you get in Indian restaurants. While I planned to save them to serve with a curry, I came home from work with a rather ravenous appetite and decided to improvise a quick naan-pizza. I topped the pizza with Asiago Pressato, the youngest form of Asiago, as it melts wonderfully and has a light, slightly lactic, tangy flavor. To this I added some grated Ubriaco al Fragola Clinto. The style of cheeses called "Ubriaco" refers to the fact that their soaked in wine or wine must for an extended period of time. These Italian cheeses are slightly sharp, with a bold flavor of dried cherries, tannins, and wine. 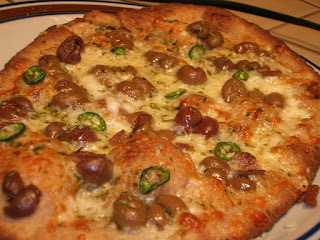 To top off the pizza, I sliced up some serrano chilies and added some olives. Unfortunately, I've been cursed with a love of arbequina olives, which are about as tiny as olives come. So it's a bit of work to get the pit out, with a little scrap of olive meat to show for it. But their flavor makes the effort a labor of love. It also makes a tasty, crunchy pizza! On a related note, I just finished reading Steve Jenkin's autobiography of his work at Fairway's Market, The Food Life. He had a rather interesting section on olives and why a lot of American's don't like olives (in comparison to the rest of the world). The Jenkster was of the mind that more people would like olives if they treated them like all other vegetables. They should be washed, dried, and then dressed, just like lettuce. So to get the most out of your olives they should be well rinsed, or soaked in cold water to leach out the salt, dried, then tossed in olive oil and herbs to marinate. For some bang-up olive oil and herb blends, use one of the oil marinades featured in the previous blog post on marinating cheese. The other wild thing he said was that the staple black olives we all grew up with are actually green or purple to start with, but they're soaked in a lye bath to quickly ripen then. This turns them black and makes them edible much soon than traditional curing methods. Which makes sense. The one and only time I cured my own olives, they had to soak in salt water for seven or nine days (the exact length escapes me), then they went into the flavored brine for another 3-4 weeks. Well, that's enough olive lore for one night! Every time I read your blog I learn something new. Thank you so much!